Simple Summer Joy(s) • Run Hard. Rest Well. Ready for summer? It’s here – with an invitation to things we often neglect. I’ve got 2 “assignments” for you today. What simple summer joys can be yours, if a tad of intentionality is factored into the weeks that lie before you? Make a list. Post it on your fridge. Share it on this post. Engage. Enjoy. Don’t delay. Don’t wait for a convenient time. It will never transpire. The operative word is N O W.
Here’s a “starter” list to put you in the mood. 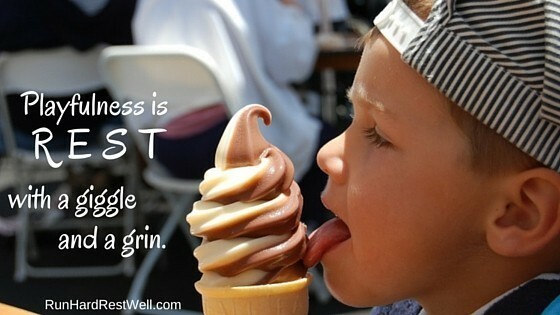 Eat an ice-cream cone. Chase down an ice-cream truck. Pick a dandelion. Lay out under the stars. Learn to skip stones. Dance in the spray of a sprinkler. (Let a little one lead the way.) Blow bubbles on your porch . . . every day. Walk through the grass barefoot. (How long has it been?) Build a sand castle. Mimic a bird; see if he talks back. Sit on your porch. Linger. Do something you haven’t done in years Ride a bike. Go canoeing. Roast a marshmallow. Nap in a hammock. Let cotton candy melt in your mouth. Dance with your shadow on a sunset walk . . .
Friends, this is just the beginning! Make this a summer of white space, Margin. Breathing room. It will tap into something mysterious and miraculous . . . for you, yes! But also for those you love. I had a chuckle when I read this. Just yesterday I rode a bike – for the first time in 8 years. You, GO, girl !!! Have a blast this summer. Jesus is smiling. I didn’t ride too far, just wanted to see if I still could. I borrowed the bike to use at our family camp in July so figured I’d better see if I could still ride. Didn’t fall or crash 🙂 Sent from my cellphone. Love the ideas! Go to a shelter and play with a pup or kitten. If clover flowers are around make a clover necklace. One for you and one to share. One suggestion…..leave your watch at home. Yes, leave the watch at home – and all electronics. Be in the moment with the ones you love and make wonderful memories! I can’t wait to hear the reports of your summer activities (or lack of them!)! Thank you for words that leap off the page into our hearts today. Sorry for the delay, I’ve been in Nebraska celebrating our nephew’s wedding – with two of our boys, Joe and Noah, in tow. What a blessing this weekend was in so many ways. With the wedding on Friday evening, we had a mini-family reunion on Saturday. So many highlights! 27 holes of mini-golf with 27 people ages 6 to 75. We laughed and cheered and contorted our bodies, willing the ball to do its thing. Wendy, thank you so much for the encouragement. It’s been a few really hard weeks in the middle of hard weeks. I’m find God closer. I’m listening. He is speaking. He brings comfort, and creativity to my life, that I would have never thought possible before. I don’t like to be knocked down, but looking up is sure a blessing! I’m with you, girl. We’ll make a difference. He will see to that! Betty — yes, yes, yes !! !